Dice, Doubloons and Random Musings: Short Notice Sanity Loss: "Dead Light"
Wednesday I got word that a friend of mine was going to be in town for a month on a job, and was looking to play some Cthulhu at Just Games. 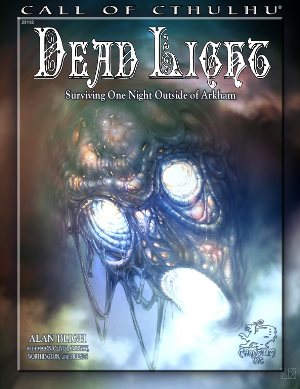 I quickly got something set up, deciding on the survival horror scenario "Dead Light," the first release for 7th edition Call of Cthulhu, as a prep-light adventure that could generate a lot of fun. I'd run it previously at Running GAGG a while back, and recalled it working well. The group I ran it for at Running GAGG, having been given the opportunity to roll up their own characters, made a group of bootleggers moving product down the Aylesbury Pike. For this time around, I decided that a set of gangsters, members of Danny O'Bannion's Irish mob out of Arkham, would be an entertaining change of pace. I decided they'd gone north to Bolton to shut down the operations of a bootlegger unwilling to join the O'Bannion Gang and confiscate his product and sales ledgers. So I rolled up two drivers (with six players, I decided to space them between two vehicles - a Ford Model T and a Model AA pickup truck), a crooked accountant, a hitman, an undercover Treasury Agent collecting evidence against the O'Bannion Gang, and a trigger-happy girlfriend of O'Bannion's, a blonde sociopath who enjoyed killing as much as she enjoyed the fineries O'Bannion's attention allowed her lifestyle. So they accidentally hit Emilia Webb with the Model T while driving in a horrible thunderstorm and the scenario begins - and begins to unravel. I had failed to consider that the gangsters would be much less scrupulous in their deals with NPCs than another group of investigators might be, as their initial plan was to splash some liquor on the poor girl and dump her at the nearest gas station and be on their way. They learn when she comes to that burglars broke into her grandfather's cottage, and there was a strange, silvery light. A drunken hog farmer at the cafe attached to the gas station also swears he saw a strange, silvery light, and as his truck, sunk in the mud, is blocking the road, the PCs are forced to go with Emilia to her grandfather's cottage, as it's on a detour they can take. They find the cottage dark, the door wide open. The two drivers get the generator in the basement going, and a quick glance turns up the grandfather, dead, seemingly from blood loss, having been shot in the shoulder. On the ground was the partially-incinerated body of a burglar, and an empty iron cask, like a big jewelry box, on the floor between them. Outside, the Boss' Girlfriend waited in the car, reapplying her lipstick, when a crazed young man came running out of the woods, screaming about a strange, silvery light. The Hitman quickly took the young man aside and executed him with a single shot to the back of the head. Shortly thereafter, the Hitman is attacked by the Light - a slithering, flowing thing, like mercury pouring through the air, flickering like moonlight in the storm. He's unable to move, enraptured by the sight of the thing, until he flicks a tendril across his chest, almost killing him with a single touch. He began to spray bullets from his Thompson at the thing, and the rest of the party comes running, guns blazing, to which the thing barely reacts. A chance flash of lightning sent the thing skittering off, and the gangsters said, "Screw this, this is someone else's problem!" Shooting Emilia Webb (she was a witness) and looting the house (carrying off $600 cash and a bank account book for $19,000), they pile back into the cars and take off back to Arkham. So clearly, this scenario didn't go quite as I intended. Everyone had fun, which was what was important. But I think next time I'll create a group of investigators with a much stronger drive to investigate and a greater sense of empathy for NPCs - or at least less of a reason to shoot them and drive away.